R-Studio is a comprehensive data recovery and undelete program renowned for its ability to recover mission-critical data lost to viruses, malicious attacks, and hardware failures or operating system crashes. R-Studio supports FAT12/16/32, NTFS/NTFS5, HFS/HFS+ (Macintosh), UFS1/UFS2 (Unix), Ext2FS/3FS (Linux) file systems and functions on local and network disks, even if partitions are formatted, damaged or deleted. RAID and dynamic disks support. ...... HFS/HFS+ (Macintosh), Little and Big Endian variants of UFS1/UFS2 (FreeBSD/OpenBSD/NetBSD/Solaris) and Ext2/Ext3/Ext4 FS (Linux). 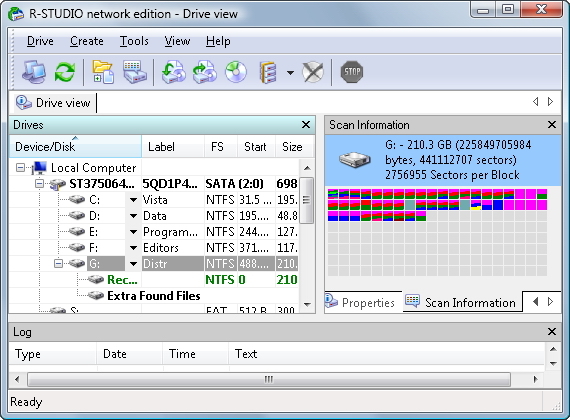 * Scan for Known File Types (raw file recovery): if the disk file system is heavily damaged or unsupported, R-Studio searches for specific data patterns ("file signatures") typical for certain file types (Microsoft Office documents, jpgs, etc.). Such known file types can be custom-defined. * Recognition and parsing Dynamic, Basic(MBR) and BSD (UNIX) partitions layout schema and Apple partition map. Dynamic partitions over GPT are supported as well as dynamic partitions over MBR. Qweas is providing links to R-Studio Data Recovery Software 6.1 as a courtesy, and makes no representations regarding R-Studio Data Recovery Software or any other applications or any information related thereto. Any questions, complaints or claims regarding this application R-Studio Data Recovery Software 6.1 must be directed to the appropriate software vendor. You may click the publisher link of R-Studio Data Recovery Software on the top of this page to get more details about the vendor.